Here's a new to me bit of wildlife from the farm. I think it's a Water Rail - Rallus aquaticus and this one was clearly feeling a bit under the weather when I found him/her resting on the lane in full view and at risk of cat attack. It didn't move when I went back for my camera and posed obligingly for a couple of snaps until it realised it wasn't absolutely safe and disappeared into some brambles. We're having some work done on the roof which meant I had to clear a corner of the garden that had become more than usually overgrown and wild. 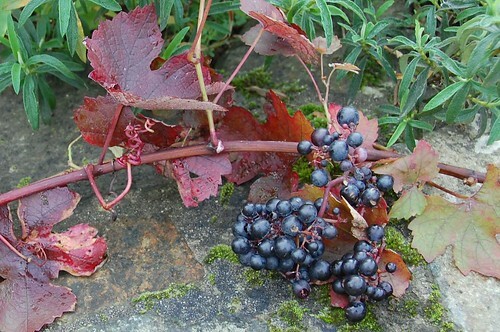 Whilst hacking back some invading willow, rampant brambles and a much unloved hydrangea I also had to restrain my Vitis vinifera 'Purpurea' or purple leaved vine. I've had this plant for ages, torturing it in a pot for years until we arrived here and I could set it free. Finally, it's beginning to show some vigour again and to my surprise has recovered enough to produce a few bunches of grapes. O.k. they are a bit sharp but in a good way and it's great to find a little unexpected harvest like this. I won't try to train the mother plant, its place is in the wilderness corner but I might take some cuttings (easy enough, this plant was from an original I had in Worthing) and give them a more structured cultivation. And maybe even, buy a few more varieties for an arbor. And so to something that I fear will never come to harvest, the Papalo. It's still hanging on in the greenhouse and has developed flower buds over the last couple of weeks but not one has opened yet and the warm autumn is dripping away into cool constant mist and drizzle. 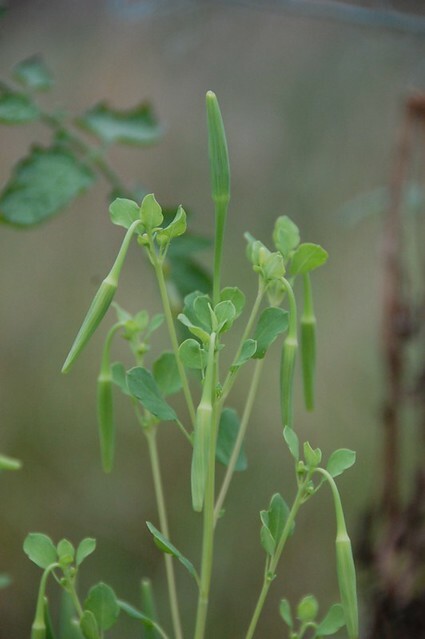 Without sun and insects any flowers that open are unlikely to set seed. Fingers still crossed. 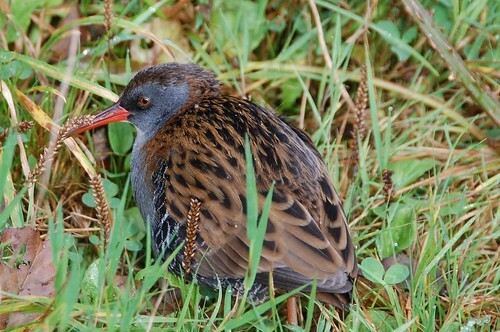 Quite right; the long red bill and blue breast are diagnostic of water rail. I've never seen one; the neaqrest I've come was a corncrake I put up on a bit of moor in Cornwall years ago. That one looked like a little chocolate brown moorhen, for about ten seconds before it vanished into a bramble patch. You have some awesome photographs on your blog!